We use Ground Penetrating Radar (GPR) to aid in pre-mitigation design procedures. During the initial design phase, the location of the primary suction point and test holes need to be confirmed. If not confirmed with GPR, then any changes to the system would require additional meetings with architects, building owners and other involved parties. 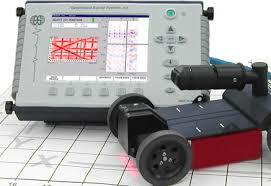 Also, GPR will protect the client's investment and eliminate mistakes. The portability and ease of operation of modern GPR systems allows the technician to easily move around a jobsite and to record a large amount of data in a short period of time. Through the use of radar waves transmitted by high frequency antennas we are able to interpret the data gathered by our equipment to locate many embedded objects, as well as measure slab thickness. 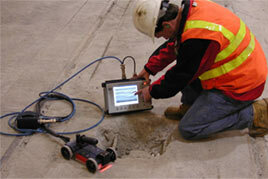 Scanning depth for concrete is typically 18” or more, depending on the age and quality of the concrete. Objects in concrete include rebar, conduits, pipes, etc. 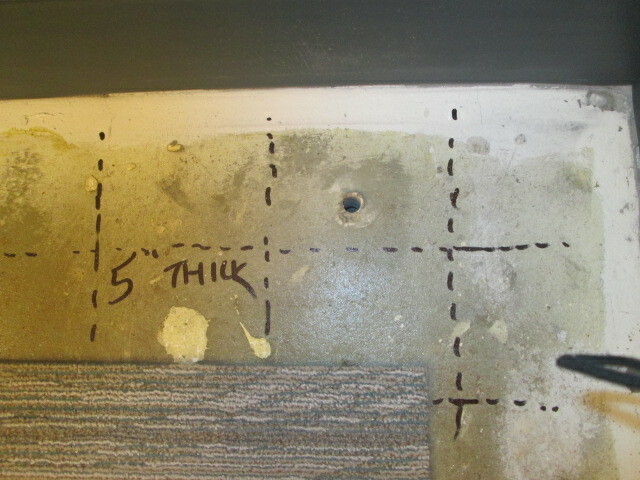 In this picture the thickness of the concrete aids in drilling the test hole. eliminating unnecessary wasted drilling time. 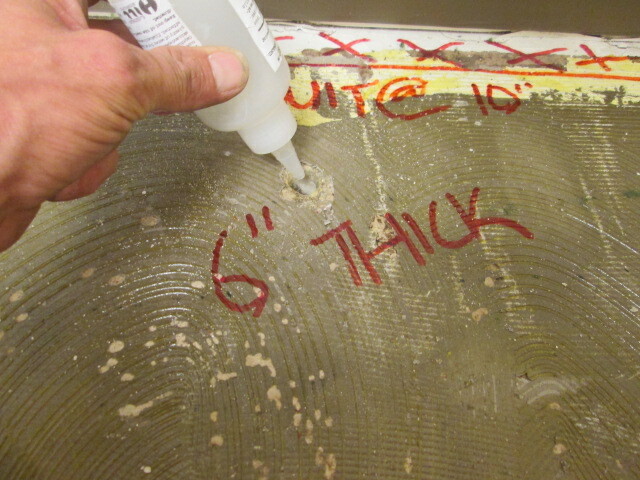 Drilling through a thinner area saves time and money for the client. 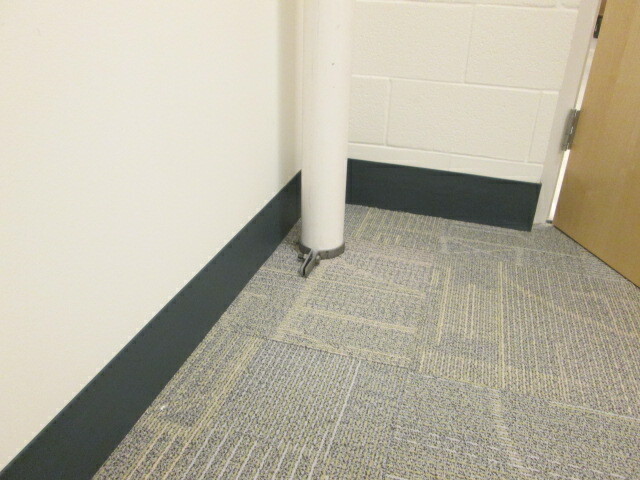 This area of the building was chosen to drill a test hole. 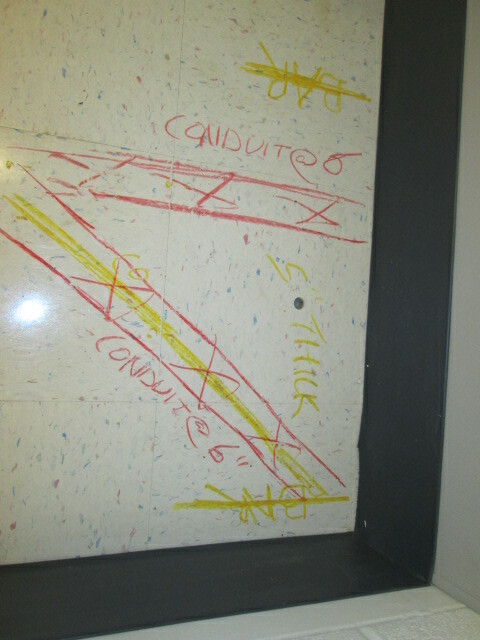 The GPR identified electrical conduit and metal rebar in the concrete slab. 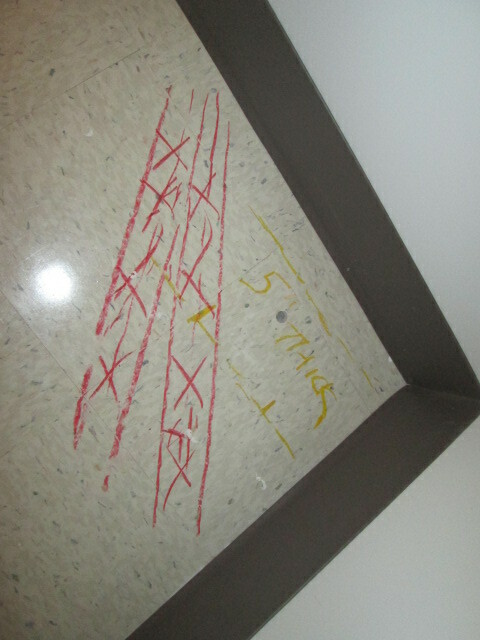 We knew exactly which areas were safe to drill. If GPR had NOT been performed, electrocution and/or fire could have occurred. GPR ensured that no injury or damage to the building occurred. 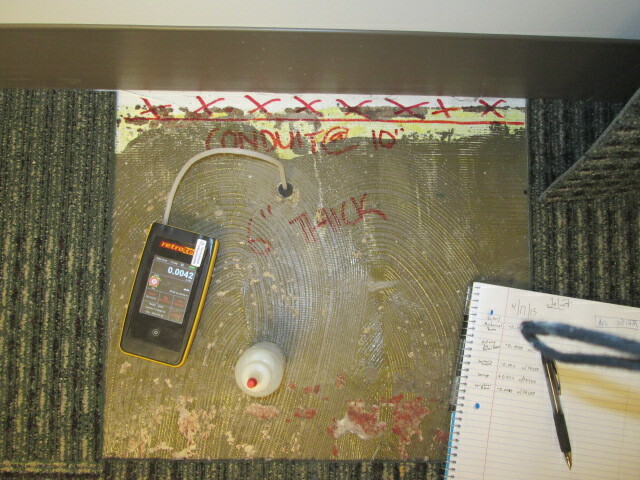 GPR identified the rebar in the concrete slab so we could avoid drilling into it. Drilling through the rebar could cause structural damage and future repairs to the concrete. 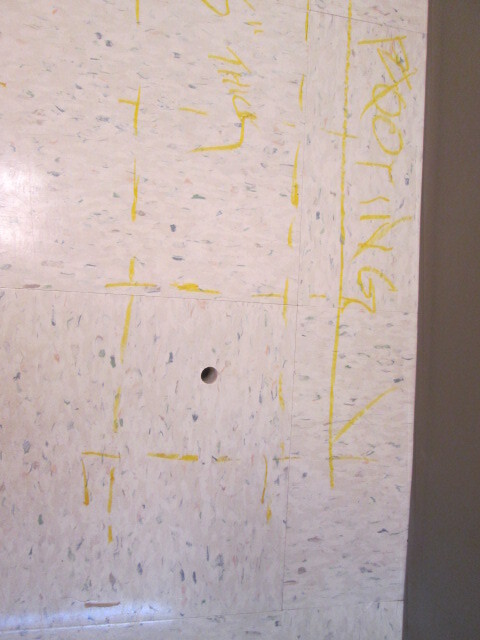 GPR identified the area that was safe to conduct our PFE testing. This manometer shows negative pressure under the slab, confirming that the system will be successful here. 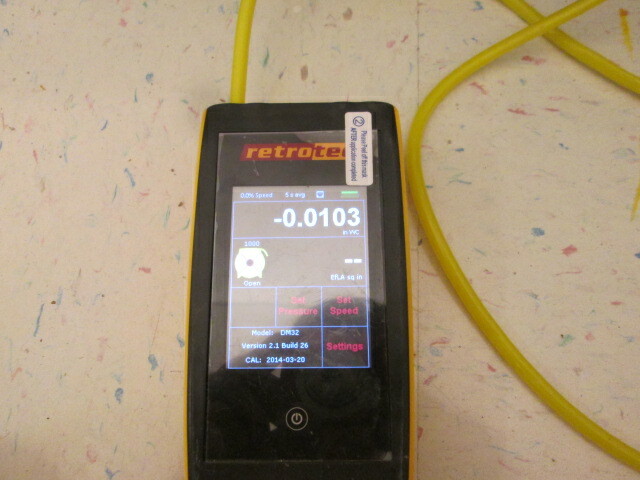 GPR identified the buried electrical line and concrete reinforcing wire. 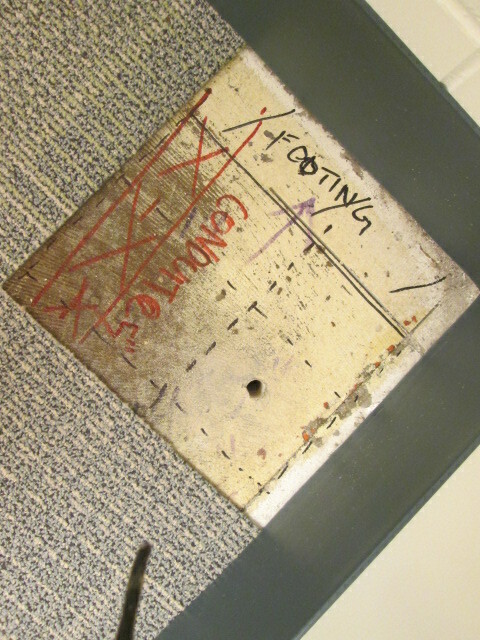 GPR identified the footing and wire mesh in the slab, allowing us to identify the safe area to install our test hole. GPR identified the footing, electrical conduit and wire mesh to safely install our test hole. This qualitative diagnostic test is a quick visual aid to confirm system performance. 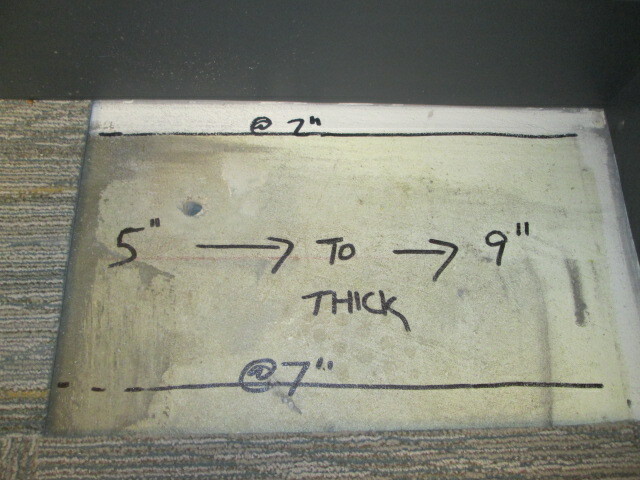 A quantitative test will follow this step. This manometer indicating pressure field extension, confirming that the minimum design criteria was met. Typical requirements would be a negative pressure of at least -0.003 in w.c.
Roof-top mounted high-suction fan with noise reduction muffler. 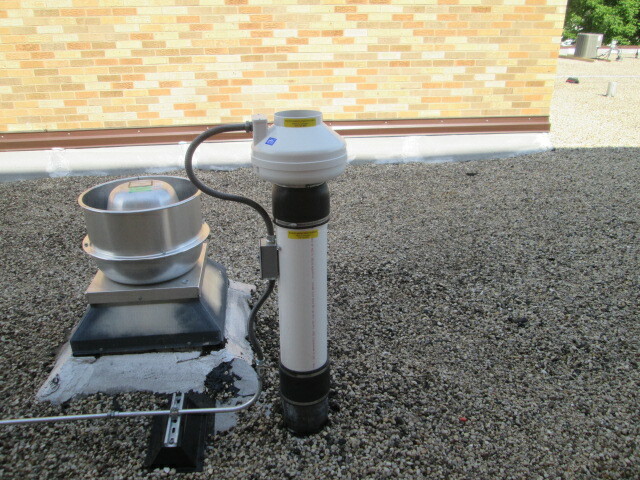 Roof-top mounted high flow fan. 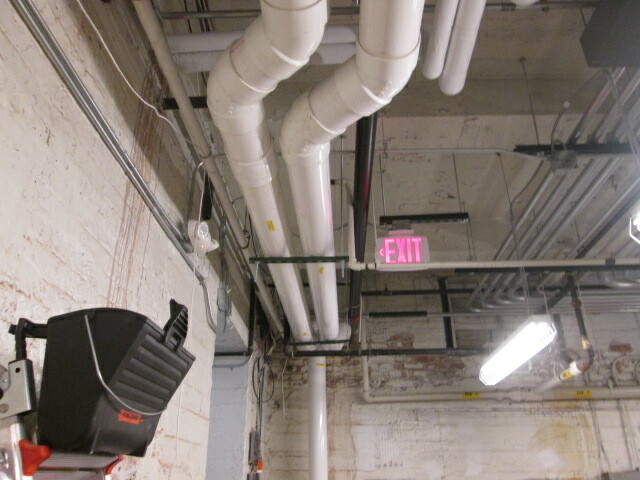 Two 6" PVC pipe horizontal runs to primary and secondary suction points. 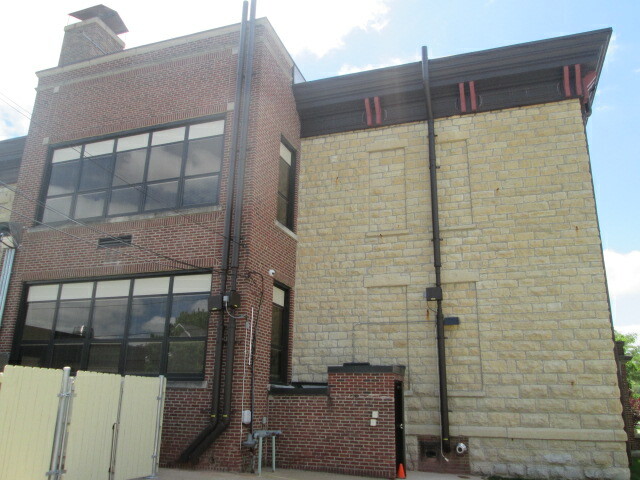 Exterior painted 6" exhaust pipe is secured to the building with "Unistrut" system. 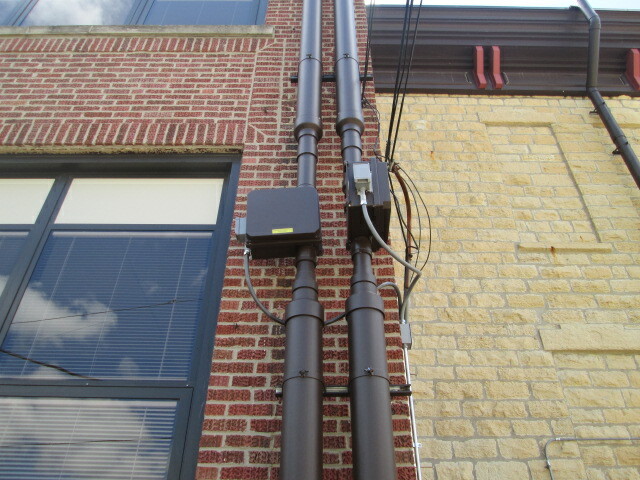 Exterior exhaust pipe of three systems with painted exhausts. Painted high-suction fans with 6" exhausts to reduce noise and improve efficiency of the sub-slab depressurization systems. 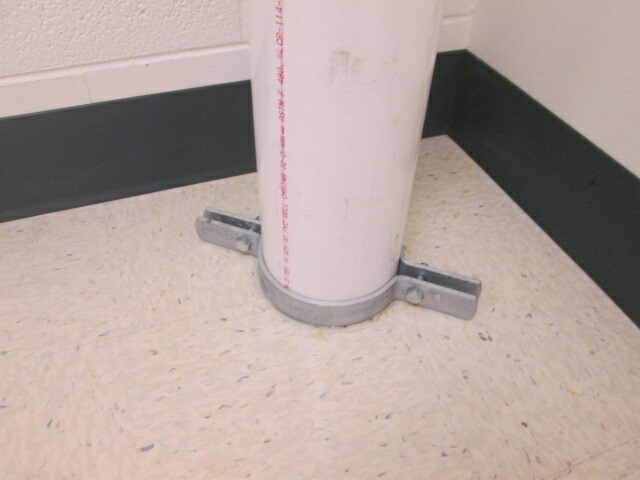 6" primary suction point located in an office. 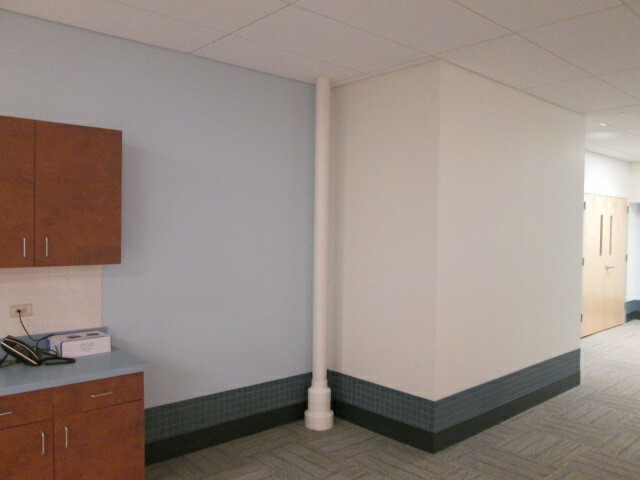 6" pipe was used to reduce the noise of the system to provide a better working environment. 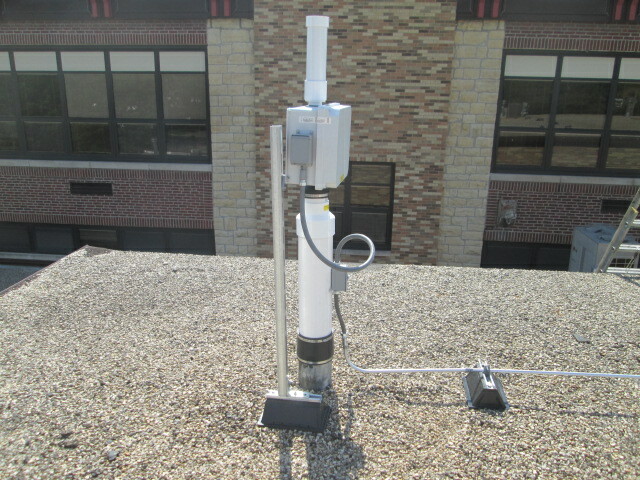 6" secondary suction point with riser clamp to provide support of the vertical pipe. 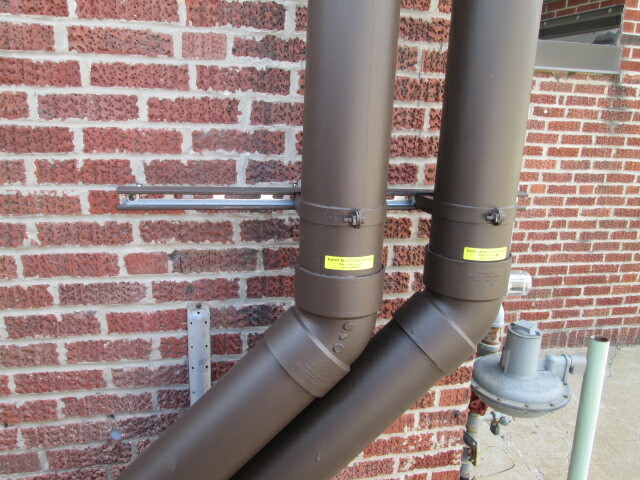 6" primary suction point with riser clamp to provide support of the vertical pipe. 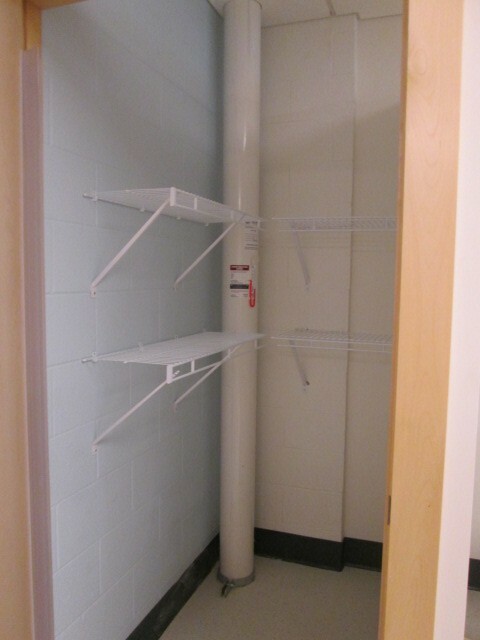 6" primary suction point located in a closet and incorporated into a closet shelf. 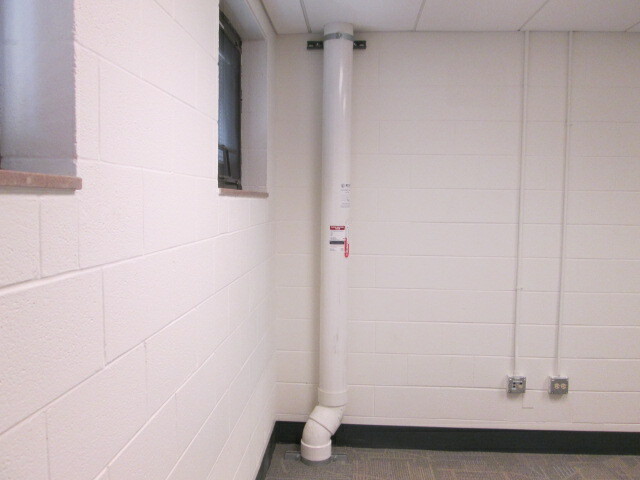 4" PVC pipe with 8" suction point to provide larger suction pit to improve PFE to capture more radon gas. 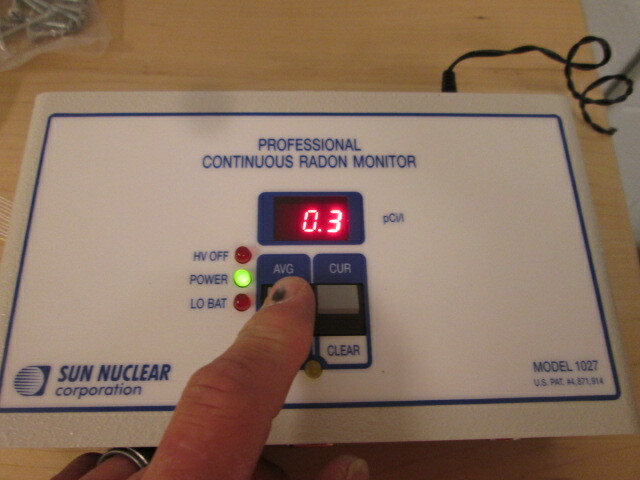 Prior to hiring a third party to conduct an official post-mitigation test, we offer added protection to the client to confirm system performance by conducting radon diagnostic testing with a continuous radon monitor. This does not take the place of a third party test and no written report will be provided.